As Ranney begins their quest to finish the season as New Jersey’s top-ranked boys’ basketball team, the Panthers have a perspective that their battles on the court pale in comparison to the battles of real life. 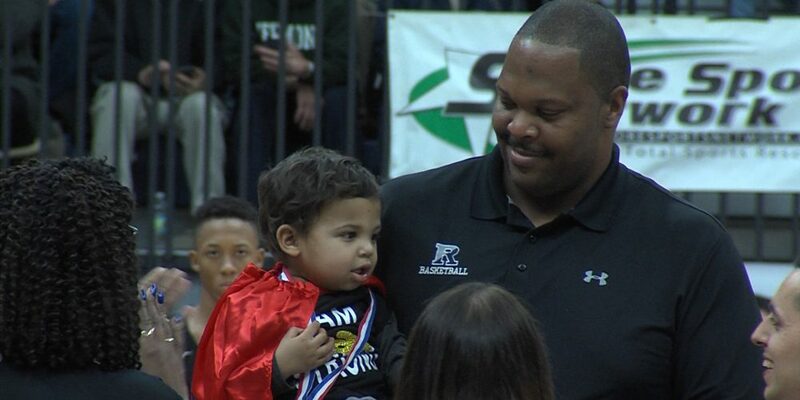 Head coach Tahj Holden’s 2-year old son, Max, has been fighting pediatric neuroblastoma for over a year. With overwhelming medical bills mounting, the New Jersey basketball community continues to rally and raise money for the Holden family as Max continues his fight against cancer. The Jersey Shore Challenge featuring Ranney and Roselle Catholic gave a portion of the proceeds from the sold-out game to Max Strong, a fund that helps with the Holden family’s medical expenses. On Saturday, Tahj’s high school alma mater stepped up with a fundraiser. All the proceeds from the RBR/RFH and Ranney/Asbury Park doubleheader benefitted Max Strong. Watch JSZ’s feature on how Max Holden has inspired the Ranney basketball team and how everyone continues to support the Holden family.